Since this is a religious text it may have been used by priests, monks and friars. The poems are in English instead of Latin, and English may have been chosen to make them more accessible to the general public. According to Treharne, most of the English pieces in the manuscript are penitential and devotional, which would support the fact they were used by priests: “judging by the texts included in the volume, it may have been intended for private devotion and, perhaps, for religious instruction.” When considering this public, Diane Speed suggests that the manuscript was used in a fraternal community or as a preacher’s commonplace-handbook. This context fits with the lyric edited here, since the lyric was probably used to tell people parts of biblical stories—or to remind them of the stories—since a lot of biblical figures are featured: ‘Abel, Abraham, Isaac, Jacob, Joseph, Moses, David and Job’. It is a possibility that this poem was used to remind the reader or listener of these famous men, to inspire them and perhaps even encourage them to follow their example. Hirsh states that religious texts were used for promoting instruction, learning, and joy. The religious theme in the poem is not surprising since the rest of the manuscript consists of more religious texts. This poem seems to be religious. It is about famous biblical male figures, each of which is given a certain honourable characteristic. Each biblical figure is described briefly, before the poem moves on to the next one. One cannot, therefore, consider this poem a narrative, but rather a collection of reminders of other narratives. The text seems to serve as a summary of the Book of Genesis. This poem can be found in Trinity College Cambridge, MS B.14.39. The hand that copied this text seems to be different from that of other texts on ff. 83v and 84r. The poem and the three lines above it are written in a lighter ink in comparison to the other texts. Dianne Tillotson explains that the iron gall ink used in many medieval manuscripts would actually have been black when the scribe was writing, but could become brown over time. She notes further that whether or not an ink would change colour would depend on the “conditions of storage, and also on the original formulation of the ink.”  The differences in ink colour described may therefore be due to different formulations of ink, since that all the texts considered here are in the same manuscript, and could not have been stored differently from each other. Another interesting feature of this poem is that it takes up less space, in terms of width, than the other texts in the manuscript. However, the poem is also similar to the other texts around it in some ways. All are of a similar length and all have markers to indicate where a new text begins. Other than these markers there are no real decorations in this short poem on biblical figures. A reason for this might be that it is a religious text. According to Murray J. Evans, these were treated differently than other types of texts, such as romances, which were often more decorated: “compilers/decorators regarded romances as distinct from non-romances, and that manuscript readers could therefore use features of layout and decoration, as well as content, to discern this generic difference.”  The text does have one striking feature in the Trinity manuscript, however: each sentence has a little red mark on the first letter. It is important to note that these little marks are not the same as the marker that introduces the text and separates it from the rest of the manuscript. The small marks might instead serve to indicate the beginning of new sentences. When one looks closely at page 84r it becomes noticeable that the scribe may have made a mistake while copying, since he made an alteration to the text. This correction can be found in line 5, where the scribe added “de” which formed the word “liwe(de)”. However this part of the folio is a little unclear, which makes the word hard to decipher. The scribe also makes use of abbreviations. Some of these abbreviations, such as the Tironian “et” (⁊), had been in use for vernacular copying since the Old English period. In line 2 of the poem one can find an abbreviation for “ra” in the name “Hab(ra)ham”. Another example of abbreviations which are used in this poem is one that represents a nasal letter like “n” where this letter follows a vowel. The name “D(aui)d” is also abbreviated, here as ‘dd’. When considering punctuation, one can observe that the scribe consistently places a point at the end of each line. In medieval manuscripts, these points in medieval manuscripts do not, as David Crystal explains, necessarily represent the ending of a sentence, but merely a pause. Some of these points could be used in the same way modern full stops are used, while others are more likely used in the way a modern comma would be. The scribe does not consistently use capitalisation when he starts a new line or sentence nor when he writes proper nouns. However, in the case of “Hab(ra)ham”, “Iacob”, “Ioseph” and “Iob,” the first letter does look like a capital letter. The dialect in which the lyric is written is likely a West Midlands variant. This can be determined through two ways. 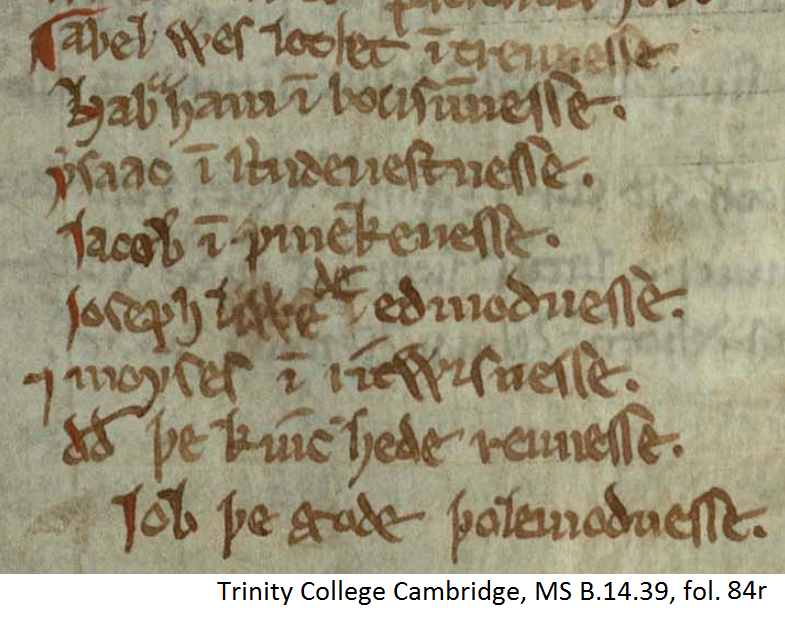 The first of these is to look at the other texts appearing in the same manuscript, Trinity College Cambridge, MS B.14.39. In her introduction to six of the lyrics appearing in this manuscript, Elaine Treharne that “the language of the manuscript may point to an origin in West Worcestershire.”  Diane Speed also writes that the dialect of 5 of the scribes who worked on the manuscript and wrote in English can be placed in this area. The second way of determining the dialect of the lyric is to look at the actual language in which it is written. Two words used in the lyric indicate that it is likely written in a West Midlands dialect. A feature maps created with A Linguistic Atlas of Early Middle English, 1150–1325, reveals that the specific variant ‘wes’ in line 1, for the first and third person singular past tense of the verb ‘ben,’ was most often used in the West Midlands. Moreover, the specific variant the verb ‘liven’ that contains a ‘w’ in line 5—‘liwede’—is revealed to be specific to the West Midlands. This evidence shows that the dialect used by the scribe is probably a West Midlands one. Crystal, David. “Printing and Its Consequences” in The Stories of English. London: Penguin, 2004. Evans, Murray J. Rereading Middle English Romance: Manuscript Layout, Decoration, and the Rhetoric of Composite Structure. Montreal: McGill-Queen’s, 1995. Print. “I Sing of One that Is Matchless” in Old and Middle English c. 890-c. 1400: An Anthology, edited by Elaine Treharne, 3rd ed, 509-510. Oxford: Wiley-Blackwell, 2010. “Love Is a Selcouth Woodness.” in The Digital Index of Middle English Verse, accessed March 4, 2018. http://www.dimev.net/record.php?recID=3272.5. Speed, Diane. “A Ballad of Twelfth Day: Texts and Contexts,” in Text and Transmission in Medieval Europe, ed. Chris Bishop, 199-227 Newcastle: Cambridge Scholars Publishing, 2007. Speed, Diane, “Study and edition of the Salvation History Poem in Cambridge Trinity College MS B.14.39” Thesis, Sydney Digital Theses, 1998. Treharne, Elaine. “Lyrics from Cambridge, Trinity College, B. 14. 39.” Old and Middle English c. 890 – c. 1400: An Anthology, Ed. Elaine Treharne. 3rd ed. Oxford: Wiley-Blackwell, 2010. 506-507. Print. Abel wes looset i(n) treunesse. D(aui)d þe kinc hede reunesse. Job the good had calmness.